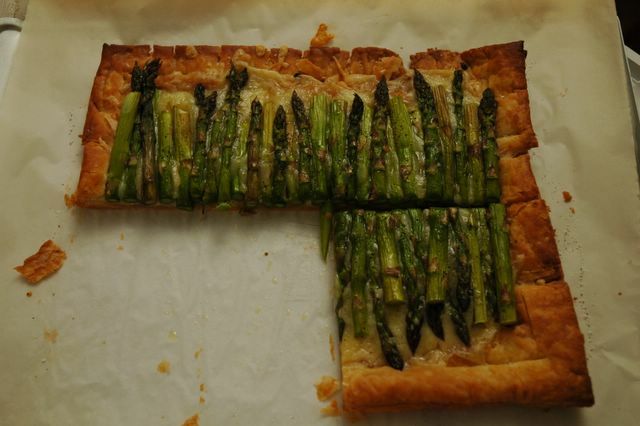 Asparagus tart -- looks good, but tastes bad. i was examining your asparagus tart when a co-worker walked into my cube. she was drooling over it and said that she doesn't care if it doesn't taste good -- she can eat the whole thing by herself. Well in Chinese we always say "looks, fragrance, and taste" are three most important things about food, and looks is placed before smell and taste. It's the first impression you have on the food. Given a blue-colored filet mignon, I don't think I would eat it even if it's one of those really well dry-aged cuts. It's the same reason why I refuse to eat some of those cheeses, I don't care how "good" they taste! one more thing -- I have had good Gruyere cheese, so I must have just bought a bad kind. Maybe as my bf suggested, we should have used a mild cheese like fontina.